If you’re a designer, architect, or builder, you’re always looking for ways to make a space stand out. Arched doorways, a spiral staircase, exposed wood beam ceilings—it’s features like these that make a home extraordinary. While geography and climate often dictate which architectural and design features are appropriate for any given home, one element is universally loved—from the sun-soaked deserts of the Southwest to the blustery New England coast. We’re talking about the fireplace, an integral feature of any home. Historically, fireplace design and construction have been relatively simple, limited to front-facing masonry hearths and standalone cast-iron stoves. Today, the hearth has evolved. Well-designed modern gas fireplaces are a beautiful marriage of tradition and innovation. Lyric’s contemporary fireplaces illustrate how designers and engineers have worked together to reimagine the hearth. Here are 5 styles by Lyric that shatter the standard image of the fireplace. With a fully three-dimensional view and see-through construction, the peninsula fireplace is a design marvel. It can be enclosed in a column or partial wall to create two distinct spaces within a larger room—such as a dining room and living room. It achieves this effect without restricting movement, and its three-dimensional view creates a visual focal point for both spaces. A real showstopper, Lyric’s see-through fireplace seamlessly divides a room while providing a peek-a-boo view into the adjoining space. See-through models are ideal for placement inside a column or partial dividing wall, helping builders, architects, and designers maximize use of space. Lyric’s corner gas fireplaces are unmatched in terms of versatility. 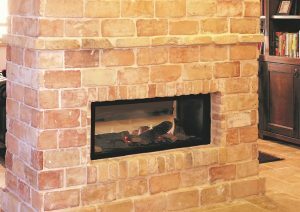 Available in left-side and right-side models, our corner fireplace models can be tucked into a small corner or nestled between two walls to transform an ordinary corner into a functional, eye-catching design element. Lyric’s three-sided construction means more ways to view the flame and more ways to arrange seating around the fireplace. Watch the fire from front, left, or right with panoramic viewing. And, with its sleek glass enclosure and minimal framing, the flames appear to dance in mid-air. Another versatile option, Lyric’s wall-mounted standalone units can be placed virtually anywhere—from a cozy cabin bedroom to an expansive living area, as long as there are adequate accommodations for ventilation (not to worry with Lyric’s power vent system, which can circulate air up to 90 feet from the fireplace). Lyric fireplaces transform an ordinary room into a conversation starter. All Lyric fireplaces come standard with safety screen barriers—pre-fitted micromesh screens that provide additional safety from high temperatures without compromising the view of the fire. And, with cool wall and power vent technology, Lyric fireplaces are engineered for safety, versatility, and exceptional functionality. Learn more about Lyric’s advantages and browse our catalog of fireplace styles for your next project.